it's the date that's important. it's eleven eleven all day long. for all your collective faces. but two blocks of printed postal pleasure. and open your mail boxes. 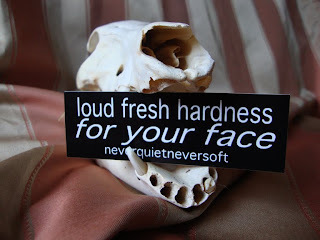 about the loud fresh hardness. 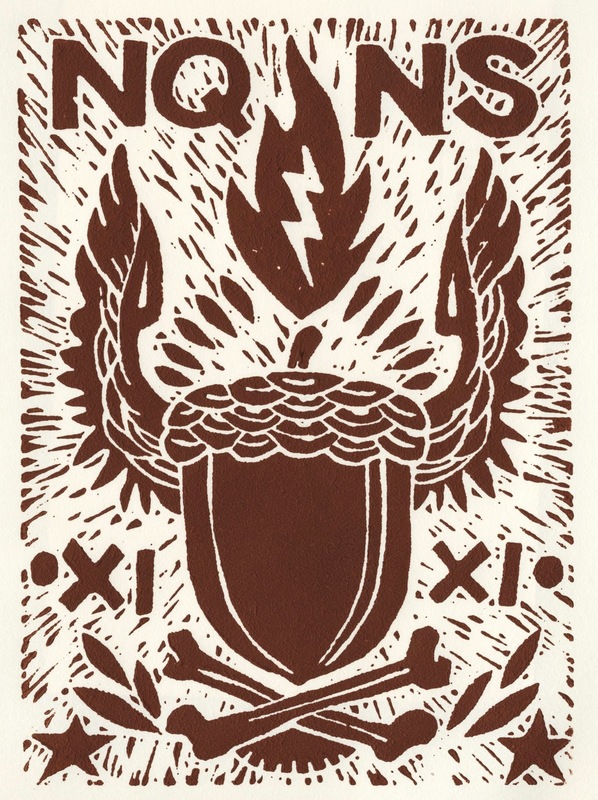 and these flaming hot art prints. we'd like to think so. of the big things to come, kids. autumny line of art and articles for all of you guys. a little bit of patience will get you a lot of hot. we'll be unleashing a whole new slew of hottness. more, and more, and more. and bringing you guys more of what you need. on to more important matters. of that crisp lined-up acorn-skull. that's even more limited than 'limited edition'. and we'll give it you. 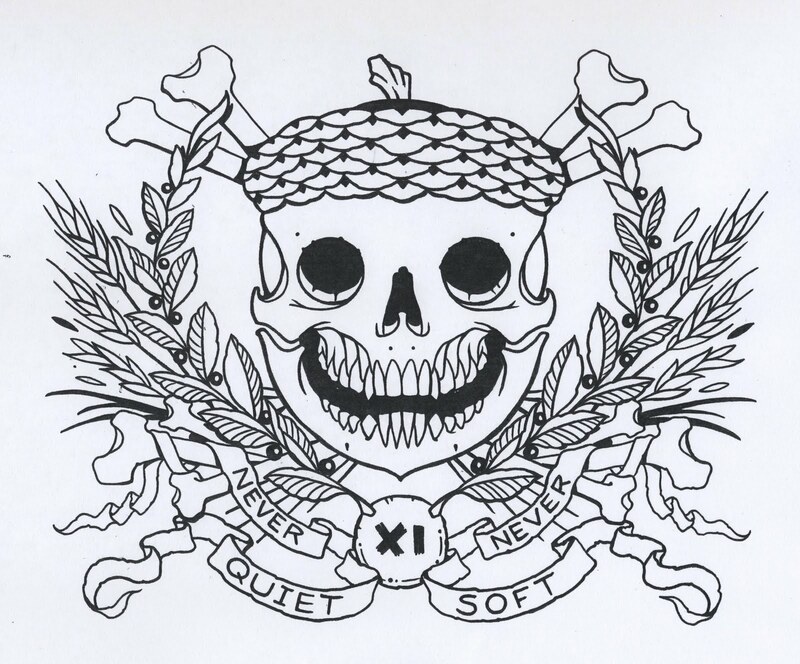 never quiet, never soft, indeed. now stop reading and start ordering. so you can now easily send us your 5 bucks for the button packs. we're going to miss some of the more creative ways people sent us money, though. snail mail with lincoln rocking an antlered meat grinder party hat? and taking that five right to eleven. we just made it easy for you. now go and get it. now we're getting somewhere after all. and you absolutely must order some. you might possibly not have any taste except on your tongue. the pins are almost overkill. but yours have opposable thumbs instead. use 'em to click up some buttons, kids. and then use 'em to fasten those dots of pure hot on all your sweaters. Here's the sneak peak of the 5 pack of button hotness. since they aren't in our hands yet. which means they are about to be on their way to you. 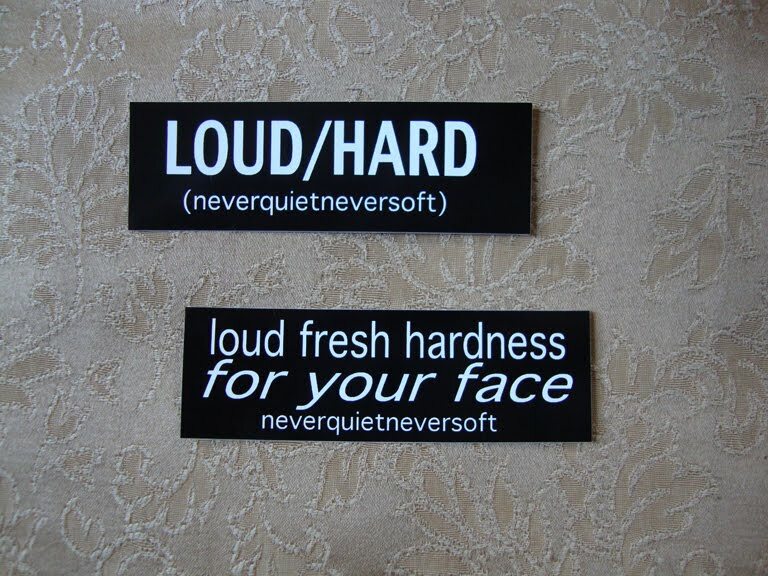 We got a LOUD, a HARD, a FRESH, an XI, and of course a NeverQuietNeverSoft. so it's all coming at you attached to the sexiness still-life ever set up. Does it feature a tuba? Five buttons for five bucks. And we'll be throwing in some stickers for free. so get them while they're here. but also a day of irony. stickers are a form of blaring advertisement. would be better served by adhesive hottness. loud and hard and fresh. just to let less aware kids out there know what's up. there was supposed to be even more special paraphernalia. there's always supposed to be more. with pre-packaged on-time delivery convenience. they'd be here for y'all already. but we aren't letting our unluckiness hold sway on today. in fact, friday the thirteenth is the scheduled arrival date. even production woes can't all-the-way rain on our parades. AND a whole other set of treats. is that a double release? ...all the way to eleven. check back on friday, and you'll see. you need a stack of each. and we need photos of the things you stick 'em on. we want to see what you've deemed loud/hard. have you ever noticed how nicely elevens and sevens go together? have you checked your calendars? very hard hottness for your faces. for goodness' sake, you've got to have one. there will be purchase buttons for you to click. more shirts after being sold out? they are SO in order. TO the undoubtedly lovely and unquestionably deserving ms. holly smalley. 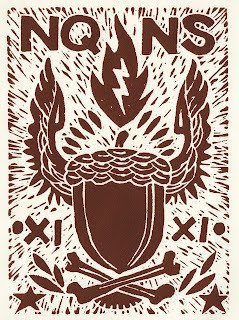 and follow the comings, goings, and doings of this site. we're putting together a little something just to say 'thanks'. because that's just how we do things around here. but we'd hate to ruin the surprise. even though the shipping was marked at $10. Probably, but we're not in this to take all your dollars. We fixed the Paypal mix-up. and the shipping is back to being a reasonable $3. including delivery right to your face. it's fixed and ready for your order. you have a refund waiting for you. Forgive us, we're just seven hours old. 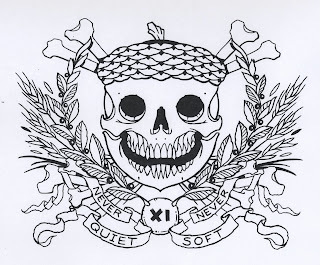 Never Quiet, Never Soft now has an online home! we're releasing brand new shirts. $11 each for a limited time. Any style, any size, just eleven bucks. New stuff will be released every month. you like the loud fresh hardness? and it's all right here, just for you. with the aim of creating something even more unusual. to make a third, unique, albeit more difficultly decipherable, language. ...and what do we do when we aren't being understood? that, friends, is what we do best. 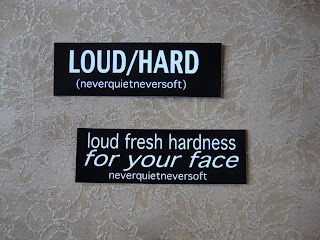 loud fresh hardness, as mentioned earlier. so prepare to be pummeled into comprehension. the iconography stands on it's own salty sealegs. or should that be taxidermied paws? acorns may be what it's ALL about. is, in fact, an F*ng tuba. and that's what makes it all work. it's how we make it. we hope you enjoy this first release. there will be new stuff...for your face.